Want something patriotic to decorate a promotional or community event, meeting, party or even a boat? Our 60' (18m+) Canada flag, red and white maple leaf poly pennant string is a perfect decorating idea for indoor or outdoor parties and celebrations. Each poly flag is sized 9"x12" (22 x 30 cm). The flag shaped pennants are spaced roughly every 18" (45cm) with 2-3' (60 to 90 cm) of extra poly string at each end for tie-downs or to link up with another pennant string. These poly-plastic pennants are perfect for year-round use or to bring out for an extra special July 1st (Canada Day) celebration. 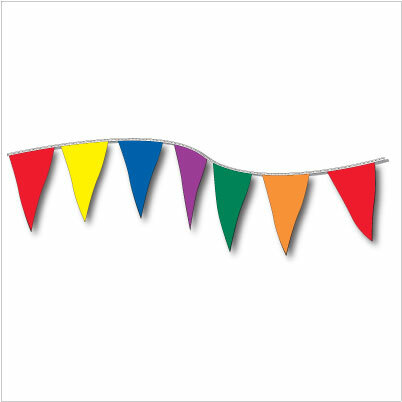 Check out our other decorating ideas with pennant strings, holiday and novelty flags.